This is our second Journal installment of Rules for Conquering the Gym, because let’s be honest: You probably have yet to conquer the gym. It’s OK. Gyms are tricky relationships. You fall in and out of love. Commitment fades. Maybe you have a torrid affair with ice cream sandwiches. All you know is that you used to go to that gym five times a week, and suddenly it becomes two, and then two becomes one, and one becomes none, and none becomes a brand new size of jeans. 1. The first three months at the gym, you will not lose a drastic amount of weight. However, you will learn an amazing amount about Drew Barrymore while watching “Access Hollywood” on the elliptical trainer. 2. Focus on technique. Have an instructor teach you proper form. If you lift a barbell like a 129-year-old man bending over to pick up a turtle, you need some help. 3. No, you’re not getting a six-pack. You’re just trying to take off your shirt at the beach without people running to their cars. 4. Avoid gyms next to liquor stores and Cinnabons. 5. Consider investing in one of those fancy computer wristbands that measures how many calories you burn walking between birthday cake parties in the office. 6. Here’s a helpful rule on gym clothing. If you’re not sure your shirt smells? Your shirt smells. 7. Everyone’s accidentally thrown a gym towel into the trash barrel. Everyone. 8. The scale in the locker room weighs everything seven pounds heavier. Do NOT dispute this. The psychological stability of the entire gym membership depends on this. 9. Every gym in the U.S. has an indestructible issue of People magazine with Katie Holmes on the cover. You can throw it into the recycling, and two weeks later, it will be there, sitting on a treadmill, open to the Katie Holmes article. 10. It’s fun to take an exotic gym class. But be careful: If you talk too much about your “Extreme Javelin” class to your co-workers, pretty soon your nickname behind your back in the office is going to be “Extreme Javelin.” Hey did you talk to Extreme Javelin about that report? Is Extreme Javelin coming to the 3 p.m. meeting? 11. Squat! You hear people say this and it’s true. If you’re not doing squats, just stop going to the gym and take $100 and set it on fire in a garbage barrel once a month. 12. The most intimate, personal thing on anyone’s phone is the WORKOUT JAM TUNES MIX. That’s where the Ace of Base and Men Without Hats hides. 13. The Clint Eastwood move in any gym is to walk up to the TV in a packed room full of ellipticals and treadmills, change it over to The History Channel, and light a cigar. 14. Nutrition is a half of the exercise battle. For real. Do not conquer the gym and then conquer The Cheesecake Factory. 16. Someone really needs to start a gym chain called Bench Press and Stare at the Wall for people who just go to the gym and Bench Press and Stare at the Wall. 17. 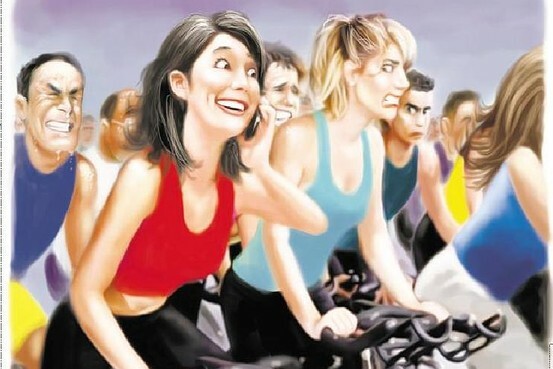 Wow you really just took a phone call in spinning class? Amazing. 1 8. Make sure to read every gym contract carefully. That gym you signed up for in 1989, in the city where you used to live? Check your credit card statement. You’re still paying $12.99 a month through 2092. 19. Every yoga class has a few show-offs who can’t wait to get to the handstands. Just let them do their handstands and get it over with. 20. Most hotels do not have gyms. They have a busted treadmill, a dusty exercise ball, and a sad TV that only gets Dr. Phil. 21. You know that CEO who claims to be working out every morning at 3:45 a. m.? Ha! The CEO just said that to a reporter once to sound tough. Totally wakes up at 8:30 a.m. and eats a huge pile of pancakes. 22. The best gym on earth is outside, and it’s totally free. 23. Everyone looks good doing dumbbell curls in the mirror. That’s why people do dumbbell curls in the mirror. But do other stuff, too, Narcissus. 24. Always end every gym class by shouting “I win! I win! I win!” at the top of your lungs, grabbing your stuff, and running out the door, laughing maniacally. 25. A visit to the gym is always better than nachos and margaritas. OK that’s a total lie. Nachos and margaritas rule. But go to the gym the next day, OK?